Billionaire environmentalist and vulture capitalist Tom Steyer spent nearly as much money on elections in Virginia last week as the Republican Party’s gubernatorial campaign arm. Steyer dropped nearly $8 million to elect Democrat Terry McAuliffe as governor, Politico reported on Monday. The sum is more than three times the investment that’s been previously reported, and it nearly matched what the Republican Governors Association, the largest GOP outside spender, put into the Virginia governor’s race. It is more money, on a per-vote basis, than the famously prolific conservative donors Sheldon and Miriam Adelson spent in the 2012 presidential election. Steyer’s other recent forays into election-buying have included massive expenditures on behalf of Sen. Ed Markey (D., Mass. ), who won a special election for a vacant Senate seat this year, and on behalf of Democrat state senate candidates in Washington state. McAuliffe endorsed controversial environmental policies enacted by the Obama administration’s Environmental Protection Agency but moderated other anti-energy positions such as his flat opposition to the construction of new coal power plants. Steyer’s attacks on Virginia attorney general Ken Cuccinelli, McAuliffe’s Republican opponent, were so effective that team McAuliffe used campaign funds to buy additional ad time for them, Politico reported. He will likely remain active in campaign politics going forward. 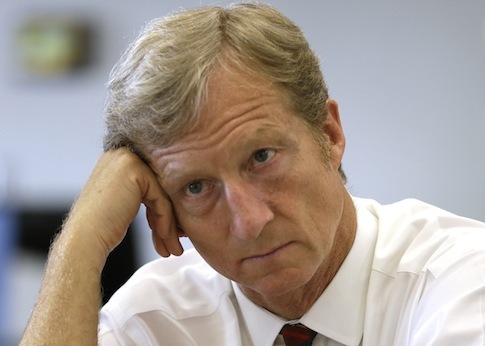 Steyer, Politico noted, "said he remains committed to his climate crusade, focusing on races where there is a meaningful contrast between the candidates on climate and where his money can make a difference." This entry was posted in Politics and tagged Democratic Donors, Terry McAuliffe, Tom Steyer. Bookmark the permalink.